The unique thing with these boots is the seam-sealed waterproof technology that ensures that your feet are dry all the time. The shoes also feature a durable rubber traction outsole that keeps your feet dry. 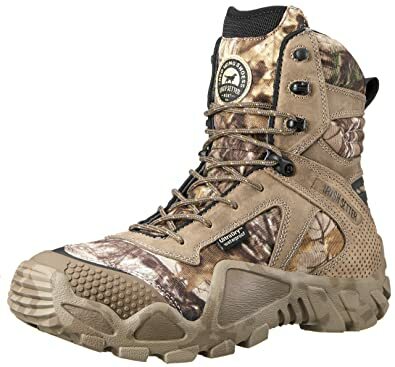 While they are popularly used as hiking boots, you can also use them as working boots as they provide you with enough traction you require when working. Timberland makes them thus you can be sure they will last for a long time. The seam-sealed full grain leather upper of the boots keeps your feet dry and ensures that the boots have a long life. While the boots are watertight, they have a perforated footbed that allows air to circulate thus ensuring that your feet breathe naturally freely. The footbed also ensures that you are comfortable thus you can be on your feet the entire day. At the time of writing this review, the work boots had over 2,801 reviews and a 4.3-star rating. Most of the reviews were positive such as: “fits true to size,” best boots I’ve ever owned,” “want to rebuy,” and many others. The major issues with the people that weren’t happy with the shoes is that the shoes weren’t steel-toed. Due to this, you have to be cautious when working. You should be on the lookout especially if you are working in areas with materials that might fall from above onto your feet. 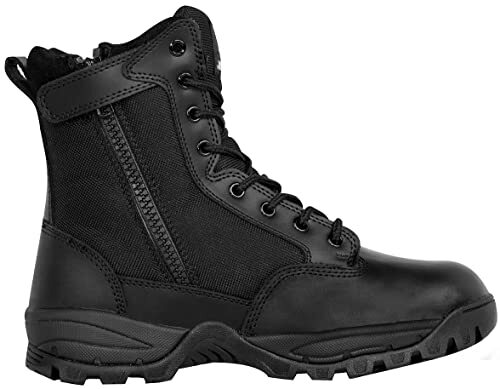 The boot is a blend of rubber and nylon. This ensures that the shoe is lightweight thus you can easily move around when working. The blend also ensures that the boot provides you with optimum water resistance. Since the boot is tall, (over 15 inches), you can comfortably work in deep waters. The lack of laces on the boots makes them more attractive as water can’t get in. You might think that the boots will be difficult to remove as they lack laces but this isn’t the case. The kick rim feature allows you to remove the boots even without using your hands. The rubber outsole not only ensures that water doesn’t get in, but it also protects you from slipping. It also ensures that the boots last for a long time. Don’t be mistaken that the boots are uncomfortable because they are made of rubber. The boots feature a comfy, breathable lining that keeps your feet comfortable the entire day. You can wear the boots on or over your pants. To increase your comfort, you should wear them with a thick sock that also keeps your feet warm. Since the boots are made from rubber, you should protect them from sharp objects. This calls for you to be cautious at the job site. At the time of writing this review the work boot had over 1,085 reviews and a 4.5-star rating out of the possible 5. Most of the reviews were positive such as: “sturdy work boot,” “nice boots,” “Mucks are the best! You get what you pay for” “they are definitely well worth your money,” and many others. The few customers that didn’t like them complained that the sole wasn’t tough enough. 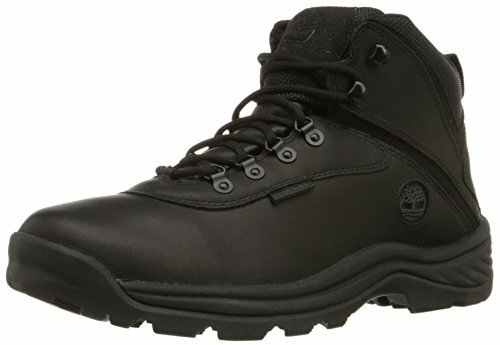 Another great safety work boot from Timberland. The work boot is made from premium, soft waterproof leather with a waterproof membrane. 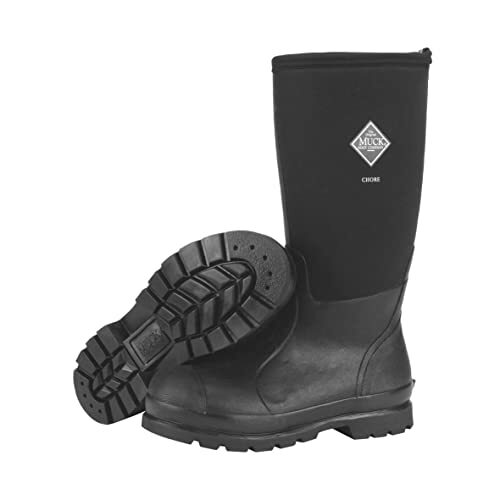 This not only keeps your feet dry when working in the moist environment, but it also gives the boot minimum break-in time. To ensure that you are comfortable when working, the work boot has a moisture-channeling spacer mesh comfort lining that has an antimicrobial treatment that aids in controlling odor. The safety shoes also have a power fit comfort system meant to provide you with maximum comfort. The system makes use of a combination of ergonomically designed elements at key points of the shoe ensuring that you are as comfortable as possible when working. 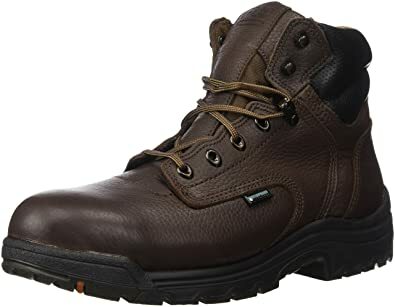 Unlike the Timberland White Ledge Men's Waterproof Boot, this one has a protective layer at the top that protects your toes from getting harmed when working. The layer is made of an aluminum alloy that provides you with the same protection you would get from a steel toe work boot, but it’s almost half the weight. This makes it easy for you to walk around. Since the exterior is made from leather, you can be sure the boots will last for a long time. The cement construction further extends the durability. 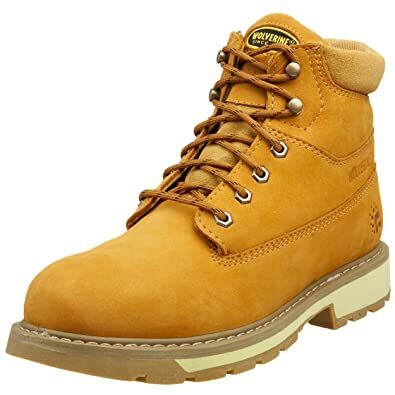 At the time of writing this review, the work boots had over 668 reviews and a 4.2-star rating. 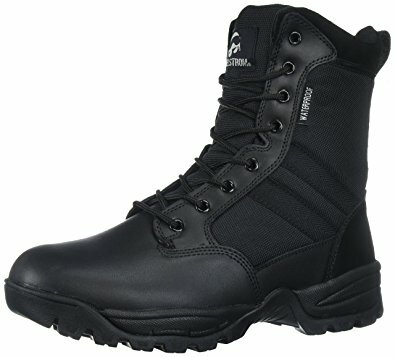 Most of the reviews were positive such as: “very comfortable boot,” “best boots I’ve ever purchased,” “Good warehouse work boots,” and many others. The customers that weren’t satisfied with the boots cited that they didn’t come in unique designs. The unique thing about this work boot is the permanent direct-attach molding used in making the work shoe. The molding plays a vital role in keeping water out of the shoe. The waterproof feature is further extended by the waterproof pigskin upper feature on the boot. To keep you comfortable, the work boot has a removable full-cushion footbed. The work boot also has breathable fabric lining that ensures that your feet are comfortable and dry. Other things that contribute to the comfort of the shoe include: thermal foam insulation that makes the boots warm to wear, and lightweight nylon shank that helps you in fighting fatigue. Since the boot is made by Timberland, you can be sure that it will last for a long time. At the time of writing this review the work boots had over 143 reviews and a 4.5-star rating. 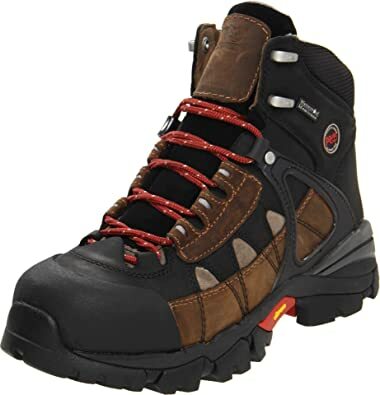 As you might have guessed from such a rating, most of the reviews are positive such as: “awesome work boots,” “insulation: 15/10,” “boots look good correct size, comfortable,” “solid work shoe,” and many others. The few customers that didn’t like the boot pointed that it took a long time to break in, which is common with most work boots as they are made from tough materials. To provide you with superior waterproof protection and keep your feet dry, the work boot features a water-impermeable membrane. The cool thing is that the membrane also provides blood-borne pathogen protection that keeps your feet in top condition. The safety shoe also features anti-fatigue technology comfort system that absorbs shock and returns energy back to the key parts of your foot. This comes in handy in providing you with added strength and stamina. Due to the technology, you can be on your feet the entire day. The toe cap is large enough allowing you to spread, bend, and flex your toes easily. This also comes in handy in ensuring that you are comfortable. Since the shoe is made by Timberland, you can be sure it will last for a long time. The material used in making it (leather) also gives you peace of mind. At the time of writing this review, the work boots had over 450 reviews and a 4.2-star rating. Most of the reviews were positive such as: “definitely recommend,” “excellent value,” “best boot ever,” “love these boots,” “nice boots so far,” and many others. The few customers that didn’t like the boots said that they took a lot of time to break in. These shoes combine a waterproof membrane and moisture management lining that keeps your feet dry the entire day. Presence of 400 grams of insulation Eco comes in handy in ensuring your feet are dry even in the harshest, coldest places you might be working in. In addition to these shoes protecting your feet from water, they are also very light thus you can be on your feet the entire day without getting fatigued. The lightweight feature is made possible by the RPM composite technology used in making the shoes. To ensure that you are comfortable when working, the shoes are made using the Cushin comfort tongue technology. This is a technology that minimizes pressure around your heel. The boot has four-way stretch nylon fibers that provide you with relief and flexibility when you are walking. The shoes also have an internal padded waffle mesh that adds to the comfort. To eliminate odors that are common with most waterproof work shoes, these boots pass through a strict scent control process where Scentban is added to the various materials. The product not only eliminates the odor from the sweat, it also kills bacteria keeping your shoes and feet smelling great. The last thing you want is heading to the store to buy new boots after just a short time. To ensure that doesn’t happen, the work boots are made using the Armatec technology. This is a technology that involves the installation of a protective covering that is tough and abrasion resistant that ensures that the boots last for a long time. At the time of writing this review, the work boots had over 494 reviews and an average score of 4.3 stars. Most of the reviews were positive such as: “Great boots!” “comfort, fit, and construction are first rate!” “best purchase this year,” “I approve,” and many others. The few customers that didn’t like them complained about size issues thus it’s important that you take the right measurements of your feet before placing the order. Dri-lex breathable waterproof membrane liner and full bootie construction that provides you with guaranteed waterproofing. To keep you comfortable, the boot has a high-performance shock-absorbent cushion that you can remove if you want to. The shoes also have a padded collar and tongue for extra comfort. While the work shoes are made from leather and have a tough construction, they are very light thus you can comfortably walk in them the entire day. To provide you with traction when working on the job site, the shoes have a slip and oil resistant rubber outsole. At the time of writing this review, the work boots had over 570 reviews and an average rating of 4.0 stars. As you might have guessed, most of the reviews were positive such as: “very comfortable, right outta the box,” “my new boots were delivered today, and they fit like a glove,” “great buy, impressed,” and many others. The few customers that didn’t like them cited that the sizing chart didn’t match the shoe size that they got. Others complained that the boots took a lot of time to break in. Since you are interested in a waterproof work boot, you should go for one that provides you with optimum water resistance. When making the purchase, you should carefully take a look at the boot. It should be made from leather, rubber, or any other water-resistant material. The boot should also have a tough construction that ensures that no water can get in. The best construction at the moment is the direct attach construction. Here the sole isn’t glued to the leather—it’s stitched ensuring that not water can get into the shoe. The construction also ensures that the boot is durable. The reason you are buying a waterproof work shoe is that you will be working in a wet environment. As we all know, wet environments are cold. Since you don’t want to get cold, you should go for boots that are warm. This calls for you to go for a lined work boot. The lining can be made from wool, acrylic or any other material. If working in extremely cold environments, go for a work boot with a lining made from wool. The lining insulates the boot keeping the boot warm. If working at extremely low temperatures, go for a boot with at least 400 grams of insulation. Wearing a waterproofed boot doesn’t mean that you should be uncomfortable. In addition to the work boot preventing water from reaching your feet, it also should allow your feet to breath comfortably. This is of great importance if you have sweaty feet. The lining will wick the sweat thus leaving your feet dry and comfortable. For this to be possible, the boot should come with soft lining material. The lining will wick the sweat thus leaving your feet dry and comfortable. For this to be possible, the boot should come with soft lining material. The boots that allow this are those that have a Gortex lining. The breathability feature not only ensures that you are comfortable, it also prevents fungi, frostbite, and other conditions. For optimum results, go for safety boots with antimicrobial properties. In addition to having a lining and preventing water from reaching your feet, the work boot should also properly support your foot and arch thus making it easy for you to walk around. The lacing systems and insole play a vital role in determining how comfortable the work boot is. You should ensure that the insole is padded and has arch support. Also, ensure that the boot has a full lacing that provides the best fit. Chances are that you will be working in mud. As you know, mud is heavy and the last thing you want is extra weight of the shoe. Due to the padding, insulation, and waterproofing, it’s common for the safety shoes to be heavy. You should take your time to research and find a pair that won’t be too heavy. Valuable work boot tips Since the boots are waterproof it doesn’t mean you should always keep them in moist environments. As rule of thumb, you should never store them in wet areas after use. Although, the boots are waterproof, excessive exposure of the boots to moisture weakens the leather thus the shoes get damaged fast. Once you are done with your work, you should wash the shoes and store them in a dry place. To get rid of clogs and other materials that might make the boot uncomfortable to wear, moisturize the weather using beeswax solutions such as Montana Pitch Blend or any other. You should avoid moisturizing your boot with oil as the oil gives the boot a moist-looking finish that clogs the leather pores thus decreasing the life of the boot. It’s common for the waterproof work boot to lose its waterproofing features after you have used it for a long time. To keep your boot in top shape, you should consider regularly applying the waterproofing solution on it. There are many solutions that you can use. All you need to do is use the best one for your boots. If you have the regular, work boots that aren’t waterproofed, and you don’t have the money to buy waterproofed work shoes, you should consider waterproofing the current boots. There are three ways in which you can waterproof your work boots: using creams, pastes, waxes, doing it yourself and using spray. This is the easiest way of going about it. To waterproof your safety shoes, you need to start by cleaning your work shoes. This calls for you to remove all the mud and dirt that might be on the shoes. Cleaning the boots using water and scrubbing them with a soft brush is enough to get rid of most of the dust, but if you feel you want the shoes cleaner, go for footwear cleaning cream. Once the boot is clean, use a clean piece of cloth and apply the paste. For ideal results, apply the paste in a circular motion, not forgetting the seams. You should rub the excess paste using a piece of cloth and leave the work boot to dry overnight. You should note that for your boots to retain their waterproofing feature you need to apply the paste at least once every two to three weeks. Atsko Sno-seal beeswax waterproofing: It’s made from Bee’s wax, unlike other products made from oil, grease or other animal products. When you apply the product, it dries into a solid wax that stays on the surface of your boot for a long time. The cool thing about the product is that it doesn’t interfere with the natural breathability of your work boot. In addition to waterproofing your work shoe, it also lubricates and conditions the leather without softening. Leather honey: It prides itself on being the best leather conditioner since 1968. When you apply it, it goes deep into your work boots thus it lasts for a long time. In fact, the manufacturers say that when you apply it once, you will stay for up to 6 months before you reapply it again. Unlike other boot conditioning products, this one doesn’t produce any odor. You can use it on both new and old leather work boots. You should note that you should only use it on your leather shoes—don’t use on sued or faux leather boots as you won’t get the best results. You also might end up damaging your shoes. Benaud's boot preservative : It’s made from the USA and you can use it on both your leather and synthetic work boots. The cool thing with the boot preservative is that it not only waterproofs and prolongs the life of your work boots, it also works as a shield against salts, petroleum, acids, and chemicals. This protects your boots from these elements keeping your boots in great condition for a long time. Mcnett revive leather boot care kit: This is a one in all kit that contains water repellent, cleaner concentrate, textured applicator cloth, and specialized boot brush. Using the kit, you will not only waterproof the shoe, you also will clean it. The product isn’t as effective as the above, but if you don’t work in very wet areas, it will get the work done. It provides your boots with water, oil, and stain protection thus keeping your old and new work boots looking great. Kiwi camp dry, heavy duty water repellent: If you love easy to use silicone sprays, this is your product. Avoid using it if your boots are completely not waterproofed. We recommend it if the seals are letting the water in. To use it you only need to open the can and spray your boot. To get the most from it, spray at least two coats. To avoid suffocation, spray it in a well-ventilated area. Waterproofing sprays are easy to use as they are like your regular body sprays. There are many types of sprays on the market that you can go for. The determining factor should be your work boots. If you have tightly grained leather work boots, go for silicone or oil based waterproofing sprays. If on the other hand, you have a suede or nu-buck leather, go for acrylic co-polymer sprays. To waterproof your work boots using the sprays you need to clean your work boots to get rid of all the dirt and mud that might be in your shoes. As mentioned above, you can easily do this using soap and water. You should then spray the boots when you are at least 6 inches away. To get the most, apply two or more coats and allow the boots dry overnight. Just like the pastes and waxes, you will have to reapply the waterproofing treatment after a few weeks. If you don’t have the spray or paste, you can use a number of tricks and give your boots temporary protection. You can smear transmission oil on your boots and you will protect them from water. The downfall of this method is that the oil tends to turn the shoe red. If you have coat enamel spray in your home, you can apply it on your work shoe for temporary protection. You should note that the enamel cracks away easily thus only lasts for a short time. Most of the leather work boots are naturally waterproof, but if you have worn yours for a long time, chances are that the oils and moisture have been lost. To waterproof the shoes, you need to clean the boots thoroughly then apply beeswax. You need to apply just a small amount of wax on a piece of cloth and rub it sparingly on your work shoe. If the first coat isn’t enough, consider reapplying another. You should remove the excess wax using a dry piece of cloth. The best products to use in waterproofing the work boots is waterproofing spray. You shouldn’t use wax as it tends to damage the “furry feel” of the suede. To waterproof your suede work boots, you need to clean the boots thus spray them when you are at least 6 inches away. You should be keen when waterproofing and ensure that you get an even coat all over the work boot. Let the work boot dry and then restore the original finish with a footwear brush. It’s rare that you will buy fabric work boots as they don’t provide much protection, but if you happen to own them and you are working in wet areas, you should waterproof them. To waterproof them you need to clean them just like the other work boots and then spray the waterproofing treatment. The cool thing is that you can waterproof them whether they are dry or wet. Just like when waterproofing sued work boots, be cautious and ensure that you attain an even coat. There are plenty of dangers that come with working without wearing waterproofed work boots. The most obvious one is trench foot disease. Trench foot is a condition that comes about when you wear wet work boots for a long time. The condition became popular during the first world war when thousands of British and American soldiers died from it. When you are suffering from the condition, you tend to have: redness, blotchy skin, skin tissue that dies and falls off, and blisters. In some cases, you might suffer from coldness, numbness, heaviness, prickliness, tingling, and pain on the feet when you come into contact with heat. While the condition might seem simple, it isn’t. In fact, it can bring about a number of complications such as amputation, severe blisters, tissue loss, permanent nerve damage, ulcers, and inability to walk on the affected foot. If you have been wearing your wet work boots for a long time, and you are experiencing the above-mentioned symptoms, you should consider visiting a doctor who will diagnose the condition. The doctor will undertake a physical examination. The doctor will look at any tissue loss or injuries that you might have acquired. The doctor will also test the nerve function to test if you can feel the pressure points of your foot. If you have been in the cold for a long time, you should clean your feet and dry them thoroughly. Remember that the condition comes about when the blood vessels of your feet constrict when they are trying to keep the rest of the body warm. As a result, there is reduced oxygen and nutrients to the feet. Since there is inadequate nutrients and oxygen, the feet tissues swell and die. If you have cuts and abrasions on your feet, the bacteria in the water can trigger the infections. By washing the feet, you activate the blood vessels thus the blood starts flowing normally. If you have cuts on your feet, you should consider an alcohol-based sanitizer or antibacterial cream that will aid in healing and also killing of the infectious bacteria. Cleaning your feet isn’t enough, especially if you have been working in cold water for a long time—you need to warm up the feet. By heating the feet, you open the blood vessels thus increasing blood supply to the feet. You can heat water and soak your feet in them. If you can’t do this, consider placing water packs on your feet. If you have access to it, add potassium permanganate to the water. The product aids in drawing water from the swollen tissue. If you have tried the above methods and you aren’t getting the results that you are looking for, consider taking over the counter medications. Some of the best ones to take are anti-inflammatories such as naproxen, ibuprofen, and others. Sometimes the condition might be worse than you thought. If you notice that your foot is turning dark blue, black or green, your foot might be suffering from necrosis (tissue death). If you don’t manage the necrosis early enough you risk suffering from gangrene which is a serious condition that might require surgical intervention. To avoid complications, you should visit your doctor as soon as possible for diagnosis and treatment recommendation. When you are working in a wet work site, you should avoid standing in the cold water for a long time even if you are wearing waterproofed work shoes. If you must work on the site, you should take breaks from the job at least once every few hours. To lower the chances of developing trench foot, you should keep your feet dry by wearing dry and clean socks all the time. This calls for you to carry a number of dry socks to the job site so that you can change when they get wet. When buying the socks, go for those made from natural fibers such as wool and cotton. They will not only keep your feet dry, but also last for a long time. You also should consider using polypropylene sock liners that are designed to draw water from your feet thus keeping your feet dry most of the time. To prevent the water from sticking on your feet, you should consider applying Vaseline on them. If you don’t like this option, you should sprinkle talcum powder on them. The powder will absorb the moisture keeping your feet dry. Some people have the notion that by wearing their socks to sleep they will keep their feet dry, this isn’t the case. It has been shown that socks prevent adequate air and blood circulation thus interfering with your recovery. Saving the best for last. You need to wear waterproofed work boots in to keep water out of your shoes. When buying the best waterproof work shoes for men, ensure that they reach your ankle. They also should be made from treated leather. This calls for you to avoid those made from rubber, vinyl or any other synthetic material. It’s integral that you wear waterproofed work boots when working in wet areas. As rule of thumb, you should buy high-quality shoes from a reputable store. For the boots to last for a long time, take good care of them by cleaning them at the end of the workday, and conditioning them when necessary.